John Wesley is a singer/guitarist, songwriter based out of Tampa, Florida. 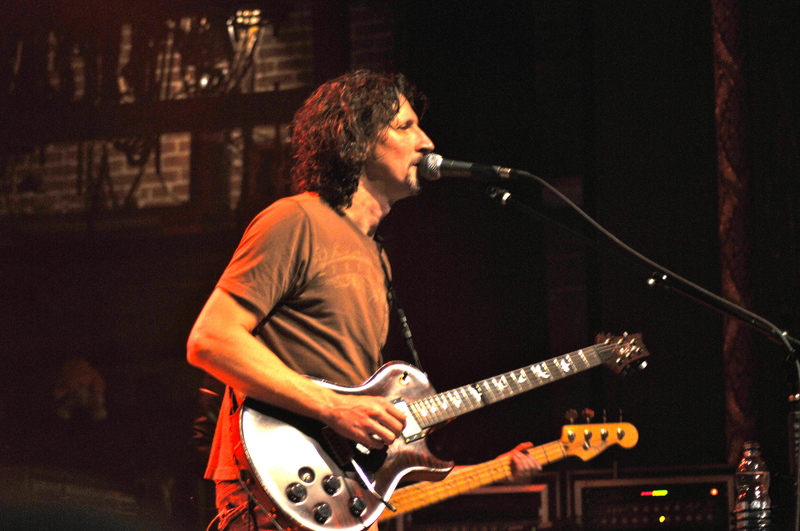 Recently he has performed as a touring guitarist for the critically acclaimed progressive rock band Porcupine Tree. In the past he has also played with Mike Tramp, former Marilion singer Fish and Sister Hazel as well. He has several solo albums to his credit. I caught up with John in Montreal at the L’Olympia as he was a support act for Marillion at their weekend convention in April 2011. He also played an acoustic show at Brutopia as well. RockShowCritique.com: Tell me about your latest release the Lilypad Suite? John Wesley: As I was writing Disconnect, a theme started to crop up. Several people I know are going through the absence of a parent. That theme started to crop up into these songs and pretty soon I noticed I had 5 or 6 tunes all along that theme. They were really cohesive and so I started to develop them as a collection or suite. And when we put it all together we said we need to record this. It wasn’t planned it just kinda happened. RSC: What are your plans for the rest of 2011? JW: Well I have a show in Boston at the 939 at Berklee . Then literally the day after I get back from that I‘ll start into working on the next record. I got a set of songs that I’ve been working on and developing for the album Disconnect. And I’ll jump right into it. RSC: Is there anything recorded for it as of right now? JW: Yes. We’ve actually recorded the entire album. There’s some things about it when we did the Lilypad Suite, some of the production values changed and we stumbled onto some new ideas and we’ve been playing the music live now and its kinda taking on a new life. so we are actually gonna go back redo some of what we’ve done. RSC: So what is your status in Porcupine Tree? JW: Live touring member guitarist/singer. I’ve been with them for 8 years, 450 shows. And its always been in a live capacity. I have helped out Steve Wilson in the studio from time to time with some guitar work. JW: I’d like to do another one. It’s just getting people geographically into one place. I’m thinking Tampa where I can put on a more extensive show. People can fly there , enjoy the warm weather and make a little vacation out of it. Maybe early next year or later this year, we’ll see what happens. RSC: Why was there such a big gap between albums since 2005’s Shiver? JW: Ya know the Shiver experience was tough because it was a record I was really proud of. And we got it released independently and there was supposed to be some expansion on the release with some other companies that didn’t happen so it was very disappointing. I was writing during that whole time period and touring with Porcupine Tree. RSC: Tell me about your recording studio RedRoom Recorders? JW: Its a studio I had going with my drummer Mark Prator since 1997-98. We formed it together as it was in my house initially. We had some decent success with it so we expanded it to a commercial room. The last year we moved it into an even bigger room. Mark works there full-time. I engineer there and run the business side of things. We do a lot of heavy metal bands. 90’s bands Obituary and DSI are some of the bands we have recorded. Thank You for your time John. For up to date info on John and his projects please visit his site at www.john-wesley.com He also has some free downloads available be sure to check them out.